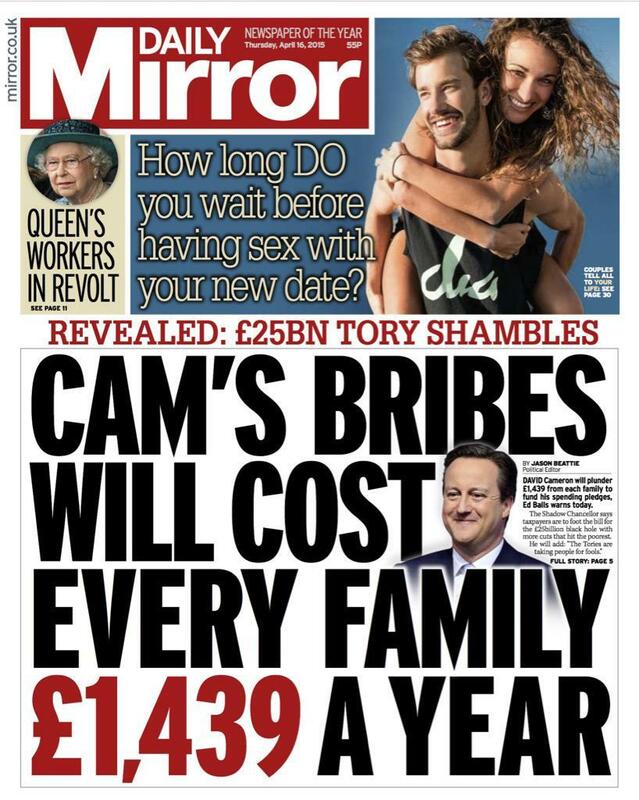 The Mirror leads with a claim by Labour that "Cam's bribes" will cost every family £1,439 a year. Or is it £1,493 (which the online version of the article says)? The paper says that Ed Balls will apparently refer later today to a "£25 billion black hole" in the Conservative manifesto. Meanwhile, the Financial Times points to a black hole in the nation's finances, claiming that the International Monetary Fund is dismissing the prospect of "Britain balancing the books this decade". The Times reports that a local authority is to abolish the policy guaranteeing pupils a place at the same school as their siblings, as parents find out if their children got into their first choice school today. We've written at length about school places here. A Labour MP is accused of hypocrisy in the Mail over her criticism of the Conservative Right to Buy policy. The Guardian says that the Liberal Democrats refuse to rule out an EU referendum. Finally, the Telegraph reports of a scramble for houses, while the Sun reveals all on Ed Miliband's second kitchen.